All I am saying is my vacation frame of mind must have officially started the moment I brushed my teeth this afternoon and realized I had just rinsed my mouth out with beer... I could use another week or two months of this! 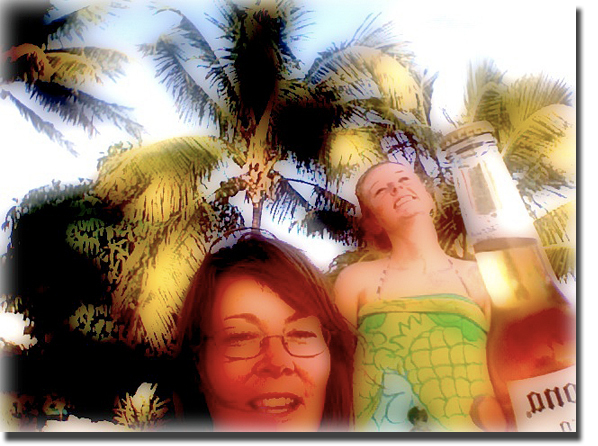 Note: The cap on the Corona beer didn't last long after this Photobooth self-portrait taken with my eldest. I had to keep up a respectable parental appearance, don't ya know? Umm, and y'all missed the tequila tasting. 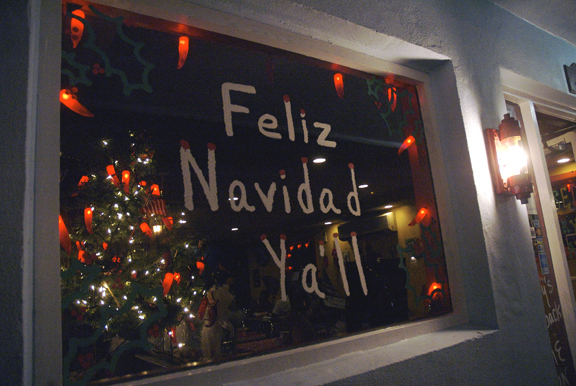 It was the first time I ever recall having folks sip several tequilas and remember it afterwards. I took this photo for my friend Randy, who should be at work this morning in Boone, while I rest 'neath this grouping of palms. 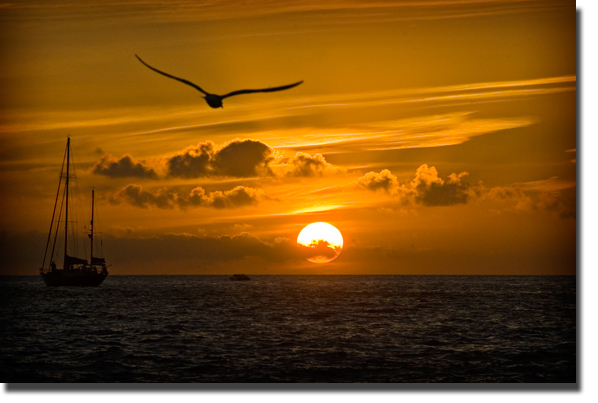 As you may have come to expect, the ordinary deviants seen at the nightly Key West Sunset Celebration bore me. The show is geared more towards the Celebrity Cruise line crowd and the Western Europeans gullible enough to fall for the "This is the only way I feed my family of four" line from the actors. Whatever. 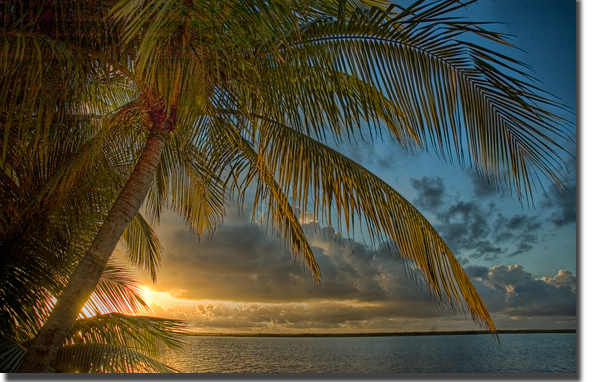 Key West and the Florida Keys are paradise. But like the Garden of Eden, temptations and over indulgences should be avoided. A Duval Crawl or two is entertaining, especially for my teenagers who are not used to the rainbow of diversity on nightly parade. But there are only so many raunchy t-shirt shops a grown-up can tolerate. 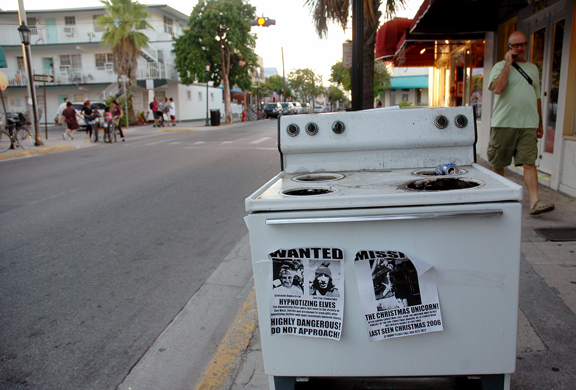 So tonight I was delighted to find an abandoned stove/ovenrange sitting along the curb on Duval St. Affixed to the front were two public announcements warning all about the "hypnotizing elves" on the loose as well as a lost and found ad for the "Christmas Unicorn." If found, please call: 305-923-7822. And the rat? Yeah. 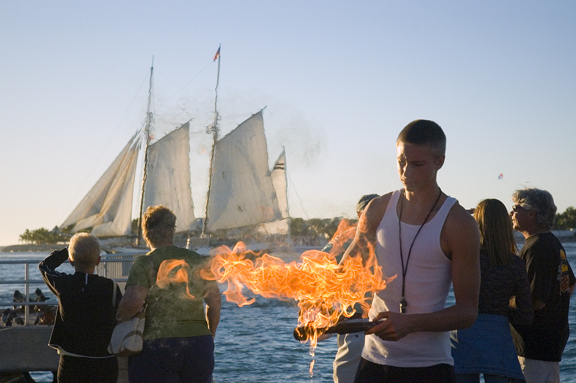 It's presence produced many a girly screams as it skittered across the sandled toes of tourists. But I laughed at it and pointed my camera at the poor dear, following it from out the door of the Key West Lime Pie Factory into a nearby alley. My family is familiar with my sudden outbursts of photographic sidetracks, yet my youngest was a bit horrified by my actions. 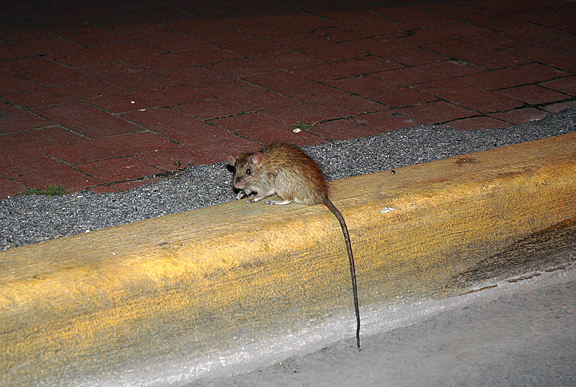 "You just followed a rat down the street and then further," she said. "So then you returned and talked to me. Ugg," she replied, adding an impressive eyeroll. My internet connection here on Key West is acting more like 24k dial-up modem circa 1995 than a modern day High Speed wireless hook-up. Guess even the internet is living on Island Time. No worries. You only get one image today rather than the several I've taken. It isn't my best photo, but the message translates nicely. And for all my buddies north of say, Miami, I have to tell ya, nothing makes this 81 degree weather feel better than watching via the Weather Channel, that gigantic pink and white glob float across the nation's upper and middle section while sipping I sip a mojito pool side.